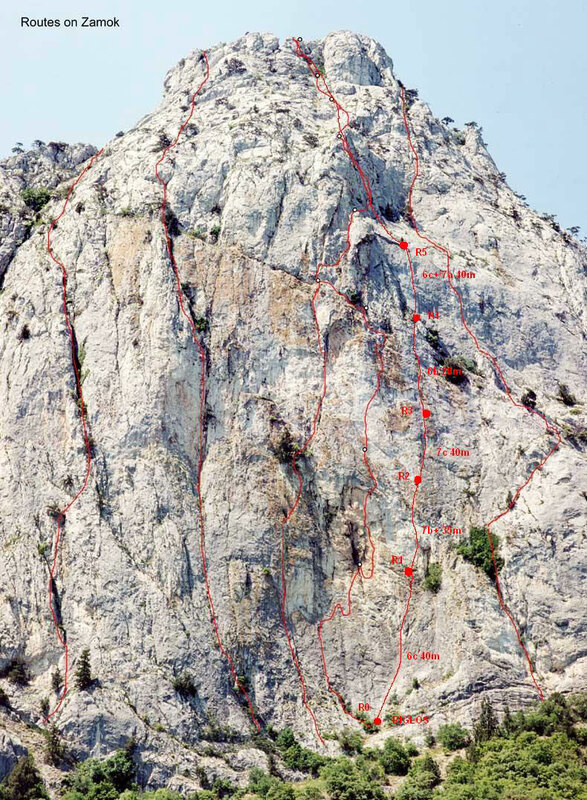 The route goes vertically upwards, without big deviations till the small cypress, a bolt near it is a belay, the end of the 5 th pitch. Then go to the left, by easy crack to the pine-tree and go to the buttress, here are the upper sections of the routes Соколиный (Sokolinuy) and Через пещеру (Through the cave). The route is cleaned from moving stones and grass with soil. But be careful while free climbing, some walls are mossy. In several places the terrain demanded some chipped holds, in other cases holes for sky hooks were made. 50 bolts are placed on the route, 2 of them per a belay, for 5 belays. Rope length is 35- 40 meters. Distance between belay points is from 2 до 6 meters. Climbing is difficult, AID may be interesting too. Addition: on the 2 nd and 3 rd pitches you can meet two sank tacks: they were used not for belay, but for equipping the route.